Donald Trump has tried his best to damage the Mueller investigation into his activities -- calling it "fake news" and a "with hunt". But he hasn't convinced the American public of that. 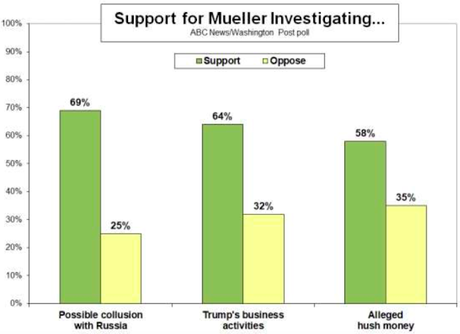 By substantial majorities, the public supports Robert Mueller's investigation into Trump's collusion with Russia (69%), his business activities (64%), and his pay-offs to women to keep his adulterous activities out of the news (58%). The people want to know if Trump is a corrupt crook. If Trump tried to fire Mueller, he would be making a serious mistake. The chart above is from a recent ABC News / Washington Post Poll -- done between April 8th and 11th of a random national sample of 1,002 adults, with a 3.5 point margin of error.